Our relaxing villa is air conditioned and luxuriously furnished for occupancy of up to 8 people, having 2 double bedrooms including a master bedroom that has patio doors & views over the pool + en-suite bathroom & further two twin bedrooms. The large secluded screened pool and patio deck backs on to a conservation area is the ideal place to soak up the sun and cool down in the stunning 30ft x 15ft pool. There is a large covered lanai for those who require the shade. The patio deck has loungers, table, chairs and BBQ. We have baby facilities including a cot and highchair. For the comfort of all of our guests this is a non-smoking property (smoking is permitted around pool /deck). 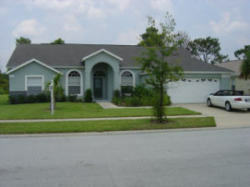 Our villa is close to the i-4, off highway 27, excellent position for all attractions. Disney is 10-15 minutes away. Within a two minute walk there are: Tennis + basketball courts, football pitch & children�s play park. 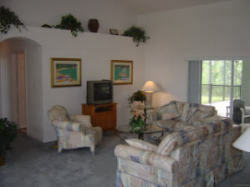 Bedroom 1 with King size Bed with patio doors out to pool area, cable TV, telephone, alarm clock plus walk in wardrobe. Bedroom 2 with Double bed with cable TV. Bedroom 3 with twin beds with cable TV. Bedroom 4 with twin beds with cable TV. En-suite bathroom to bedroom 1 with bath, wc, twin vanity unit and large shower. Bathroom 2 with bath, wc shower, twin vanity unit plus access to pool area. Oven, hob, microwave, fridge/freezer with ice maker, dishwasher. Cable TV, DVD player, playstation 2, CD player, games and books. 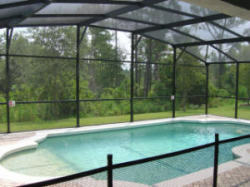 The stunning private pool which overlooks a conservation area is 30 x 15ft with large covered lanai. The pool has a child saftey fence. The pool can be heated for a additional charge of �100 per week (recommended Oct-Apr). BBQ, sun loungers, tables and chairs. 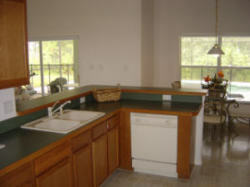 Tennis and basketball courts, soccer pitch and childrens play area are within a 2 minute walk. There are 8 golf courses within 7 minutes drive of our villa; however, there are around 50 within a 30 mile radius. The Atlantic coast (Cocoa Beach) is approx 45 minutes drive away and the Gulf coast (Clearwater) is approx 90 minutes drive away. Numerous shops and restaurants within 2 miles. Booking form to be completed. Deposit of �100 per week required at time of booking. Balance due 10 weeks before you go. Stays of less than 7 days will be subject to �50 cleaning charge. Discounts available for 3rd week. All prices are inclusive of sales tax.